This recipe I'm quite proud of as it is my recipe. The original idea came from a Janelle Bloom cookbook, but I tweaked it enough to call this mine now. When I post recipes I have to love them, and although the original recipe was lovely it just wasn't a 'love' for me. So I tried it again but with a few modifications and I came up with this version, which I 'love'. The pastry is so easy, mix it up in a food processor, then using your hands press it into the tin, no rolling pin required. It is lovely, crisp, buttery, everything a pastry should be. As for the fruit, I used fresh fruit. You can use frozen berries, just eat it right away (or while still warm) as the berries can soften the crumble top. The addition of apples was my idea, as I felt there wasn't enough fruit the first time I made it. But although I haven't tried, I'm assuming you could use other fruits when in season. Once I try will let you know. 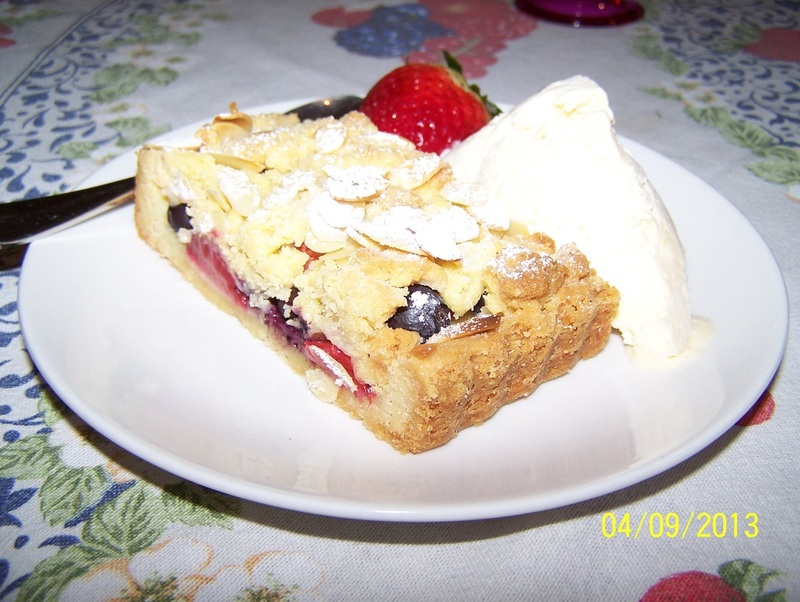 Very simple dessert with a fabulous outcome, I like it served with some vanilla ice cream. Preheat the oven to 180C. 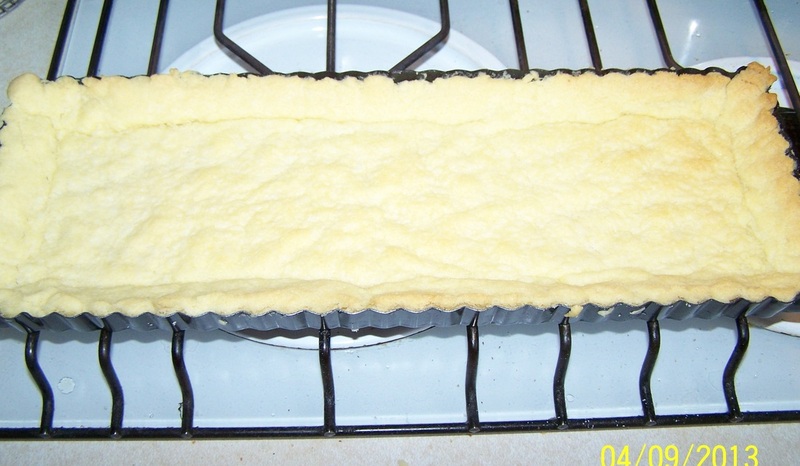 Grease a 2 1/2cm deep, 11cm x 34cm (base) rectangle flan pan. Combine the flour, almonds, sugar and butter in a food processor. Blitz it until the dough just comes together. Reserve 1/3 of the dough for the crumble top. The other 2/3 needs to be pressed into the flan pan, using your hands, covering the base and sides. Try and keep the dough an even thickness. Watch the base edges and corners are not to thick. Bake for 15-18 minutes, until light golden. Set aside to cool for 15 minutes, while you prepare the fruit. Increase the heat to 200C. Place the apple slices over the warm pastry, each piece slightly overlapping the other. Use only enough apple to cover the entire base. Scatter over the berries. The remaining pastry now needs to be crumbled evenly over the fruit. Scatter over the flaked almonds, gently press the almonds and crumble, so that it secures the topping to the fruit. Bake for 25-30 minutes, or until the crumble top is golden. Allow to cool for a minimum of 1 hour in the pan, can stay longer. Dust with icing sugar. Cut into slices while still warm or at room temperature, serve with some vanilla ice cream.